Online ticket sales are closed. Tickets still available at the doors, through 3pm ! 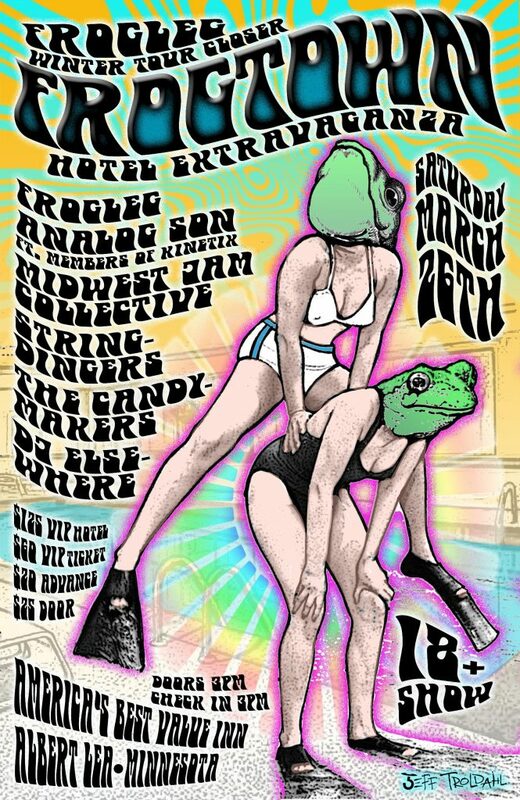 Since their first show in late 2012, a major buzz about the band Frogleg has been slowly and organically spreading throughout the Twin Cities music scene with their ever-growing weekly tradition, “Frogleg Thursdays @ Bunkers Music Bar & Grill” in downtown Minneapolis. Known for their songwriting and improvisational live performances, this seven-piece would be best described as a band that plays soul music, as their influences are not drawn from one specific genre. A typical Frogleg show will usually feature a unique blend of Bluegrass, Funk, Reggae, Jazz and Rock. Analog Son was created by Jordan Linit (Kinetix/Ableminds) and Josh Fairman (Kinetix) in 2013 around a studio project involving the Shady Horns, Ryan Zoidis and Eric Bloom (Lettuce/Soulive), and Joe Tatton (New Mastersounds). Since conception the band has recorded two records with 30 amazing musicians, and have been playing shows to enthusiastic crowds. In their short existence, Analog Son has supported The Funky Meters, Snarky Puppy, Trombone Shorty & Orleans Avenue, The New Mastersounds, Maceo, Victor Wooten, Dirty Dozen, and Orgone at some of Colorado’s premiere venues.